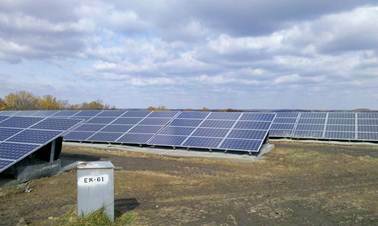 The Howard County New Cut Road Landfill/Worthington Elementary School Solar Energy Project began when the County Executive and the Howard County Department of Public Works tasked the Northeast Maryland Waste Disposal Authority with developing and issuing a Request for Proposals (RFP) for solar energy development at the New Cut Road Landfill. The RFP was issued to select and contract with a qualified vendor for the design, engineering, financing, construction, operation and maintenance of a solar array (Solar Project) to provide power to the Worthington Elementary School (School). The County offered approximately five (5) acres on the top of the closed landfill. 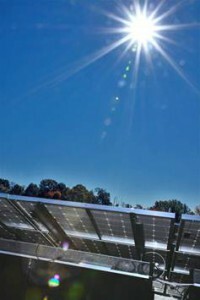 The Authority received a SunBurst grant for the Solar Project from the Maryland Energy Administration. 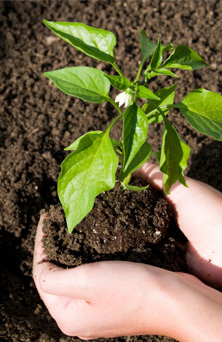 This grant reduced the overall cost of the project. SunEdison was contracted to design, build and maintain the solar panels. Permits were issued for the project in August of 2011 and construction began in early September of 2011. The array was substantially complete in November of 2011 with final operations approval in December of 2011. The solar project is comprised of 1,908 solar panels on metal girders attached to recycled plastic tubs. These tubs sit on top of the landfill and do not penetrate the protective soil cover. Stone fill is used as ballast for the tubs. 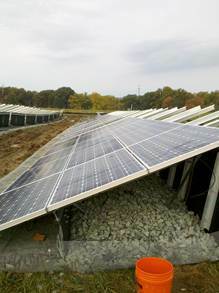 The solar project has produced approximately 1,092 MWh of electricity since in began operating in 2011, representing over 90% of the needs of the school. SunEdison provided solar curricula for the Howard County Board of Education to use during classroom discussions of environmental sustainability and renewable energy. Profile of the solar panels mounted on the ballasted tubs. Erosion controls were built into each row of tubs.